Autumn in Whistler meant one cannot enjoy the lakes and watersports of summer nor the splendor of white powder of winter. However, I was already in Vancouver and had the desire to venture slightly more north, especially since it meant driving along the famous Sea-to-Sky Highway. And best of all, after consecutive days of rainy, gray skies in Vancouver, we were guaranteed days of sunshine in the Whistler area. My first stop en route to Whistler was in the little town of Squamish specifically for the Stawamus Chief, the second largest freestanding monolith in the world. Sitting along the highway, the towering 700-meter rock wall is impossible to miss. 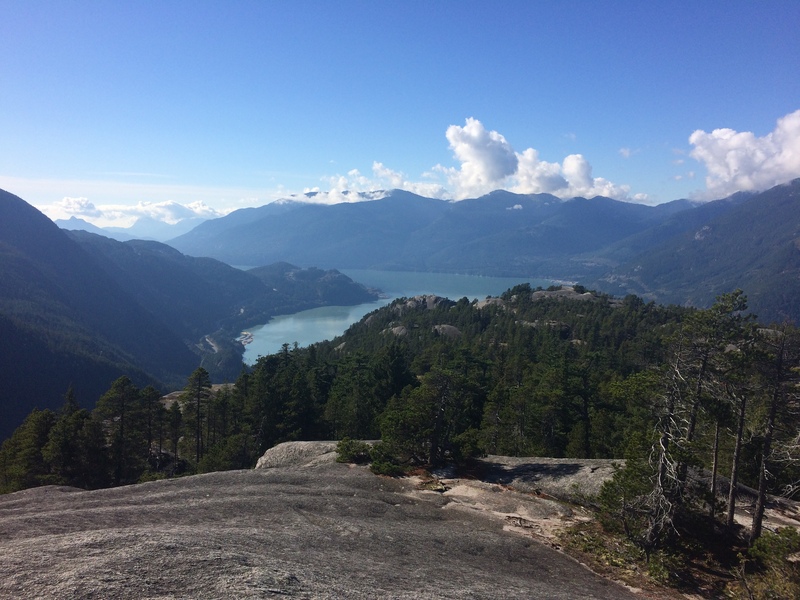 It is no surprise that the Chief’s three peaks were once sacred sites for the First Natives and is now a magnet for rock climbers and hikers; the views from the peaks overlooking the creamy-blue Howe Sound are incredible. At first I thought there would just be a parking lot/trailhead, but when we arrived we discovered a large campground and water spigots that were unfortunately already closed for the season. This would have been an excellent place in the summer. Once again I overestimated the time and endurance needed to summit. Maybe it was due to powering up the Grouse Grind just the day before, but the climb up to the peaks weren’t as grueling as they were made out to be. I didn’t want to keep Chris waiting for too long (he hunkered down in the parking lot to work) so I skipped First Peak and summited the Second and Third Peaks. It just so happened that trail up to Second Peak was the trail with chains. Good thing because I definitely needed them. It took me just about an hour to summit Second Peak. Here is the view looking at First Peak. Can you find the two people standing on it? And a pano from Second Peak. 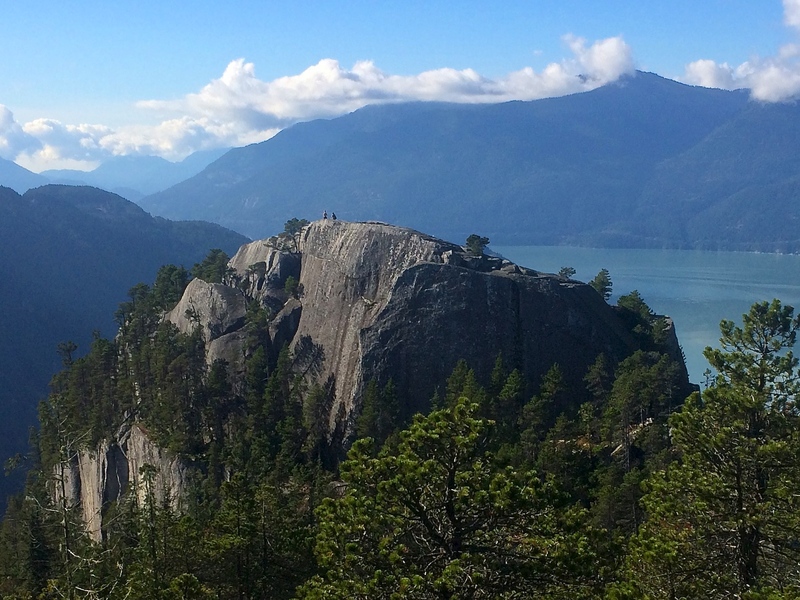 Conveniently located on the highway not far from Vancouver or Whistler, the Stawamus Chief is absolutely worth the climb on a clear day. The hike does not require too much time, its views are incredible, and it’s FREE! Next was Whistler. As I mentioned earlier, shoulder season meant we couldn’t swim or snowboard. So what’s a bored Jean to do? 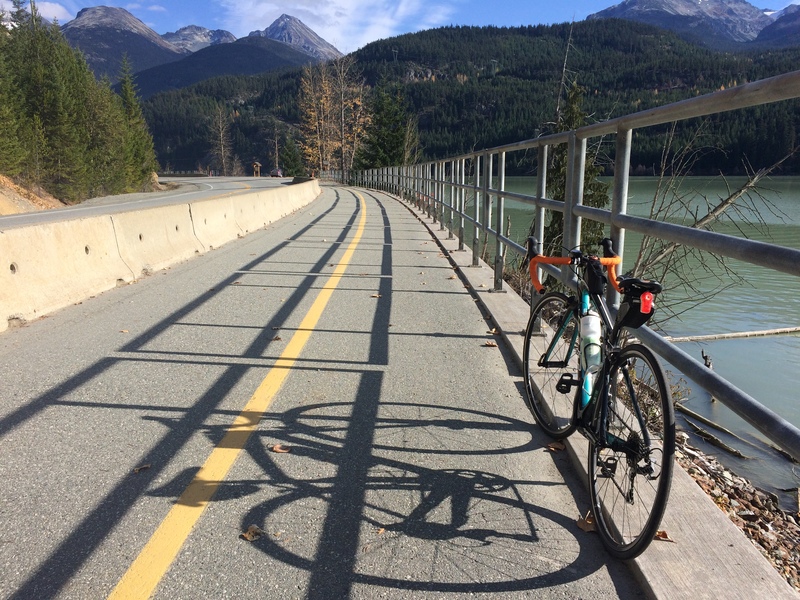 I hopped on my bike and pedaled a quick 20 miles to Pemberton. Yay! Our 2-day trip along the Sea-to-Sky Highway though very brief was beautiful and memorable especially due to the views from the Stawamus Chief. I can’t wait to return in the summer or winter months. 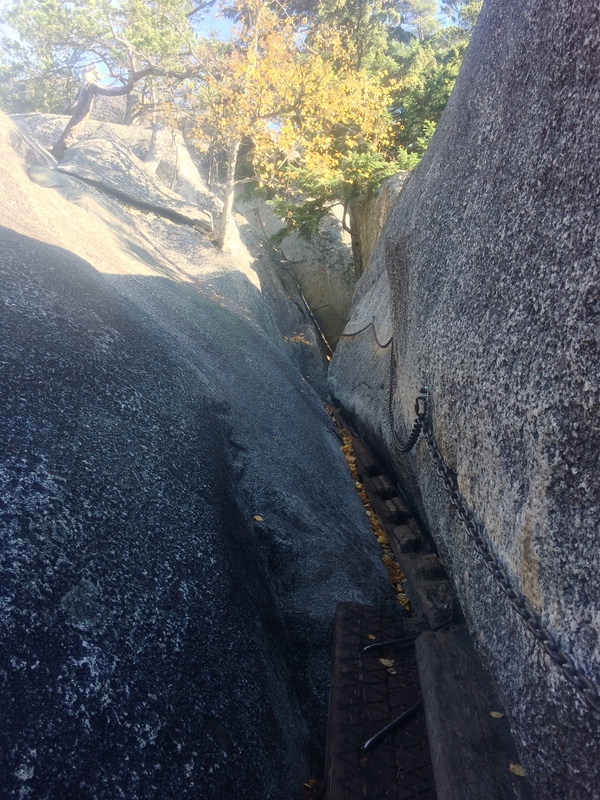 This entry was posted in canada and tagged stawamus chief. Bookmark the permalink.